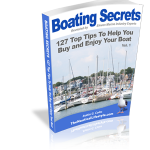 Below is a list of questions put together for interviewing purposes on putting “Boating Secrets: 127 Top Tips to Help You Buy and Enjoy Your Boat” together. Feel free to pick and choose the questions you’d like to ask. How long did it take you to put this book together? What was the interviewing process like? Where can people buy your book and how much is it? How did you find these SME’s (subject matter experts)? What’s the title of your book and how long is it? What are one or two tips you got out of the book/interviews? What would you tell your audience the biggest reason they need to purchase or have this book in their library is? Who’s your target audience or ideal reader? Do you have any book signings coming up? What other format is your book available in?